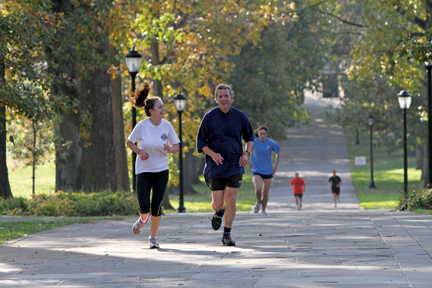 Runners climbing Magill Walk still have breath enough to share a laugh. 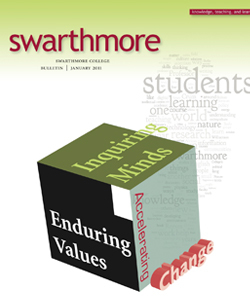 Clear, crisp, colorful, congenial—all are words that describe the three days in October when more than 1,000 alumni, parents, friends, faculty, and staff convened on campus for Swarthmore’s first-ever Garnet Homecoming and Family Weekend. 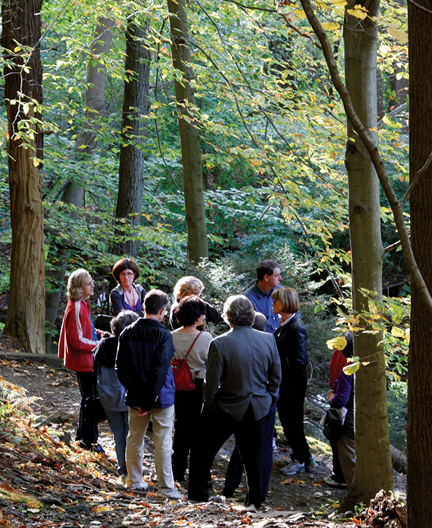 Outside, beneath brilliant blue skies and autumnal trees, groups gathered together to take tours of the Crum, follow Friends Historical Library Curator Christopher Densmore around the campus to learn about the College’s connections to the Underground Railroad, or see gems of the Scott Arboretum revealed. 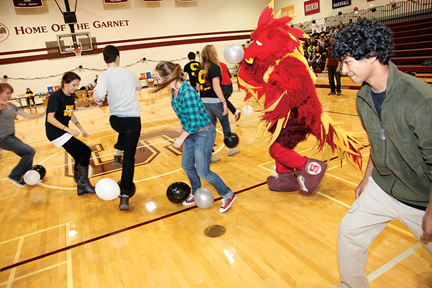 Sports enthusiasts reveled in suspenseful Garnet soccer, volleyball, squash, and hockey matches. Those with an appetite for food followed their noses to a delightful picnic of local foods, served in a tent on Parrish Beach. Indoors, a pep rally drew raucous crowds; McCabe lecturer Glamour magazine editor in chief Cindi Leive ’88 attracted a fascinated audience of more than 400; a variety of faculty lectures lured the intellectually curious; and multiple receptions and organized conversations gave occasion for visitors to chat with President Rebecca Chopp, the innovator of an event that was declared a resounding success—to be repeated Oct. 21 to 23, 2011. 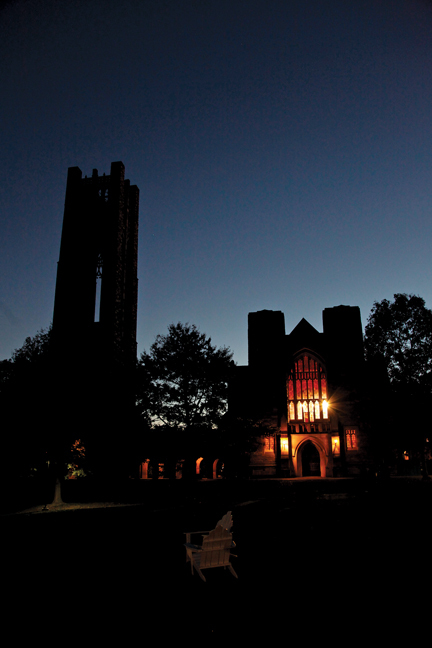 The warm light of Clothier Hall. 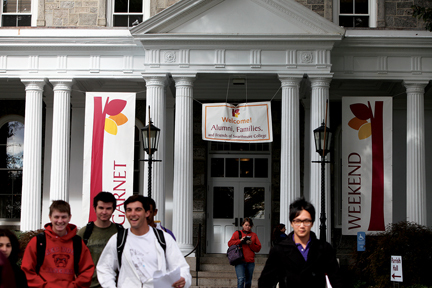 Festive banners on Parrish Hall welcome alumni, parents, and friends. 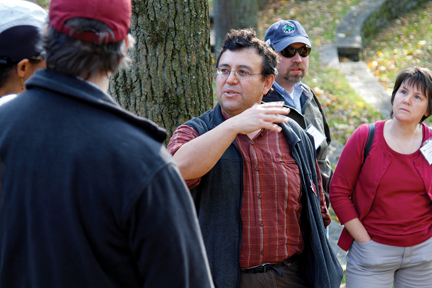 Associate Professor of Biology Jose-Luis Machado (above) and Professor of English Literature Betsy Bolton (below left, in red) co-lead a tour of the Crum Woods. Phineas Phoenix is at his most flirtatious when there’s a crowd. 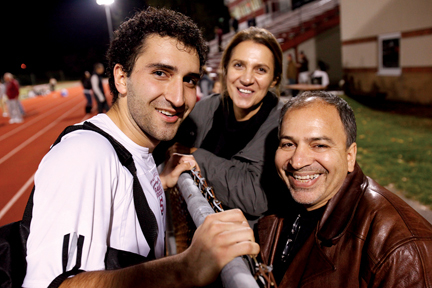 Soccer player Arsean Maqami ’12 greets his parents. Their broad smiles light up the night. Robert Norman ’49 enjoys coffee and conversation with President Rebecca Chopp. 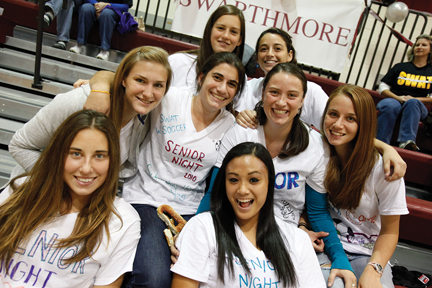 Senior members of the women’s soccer team are pumped at the Friday night pep rally. 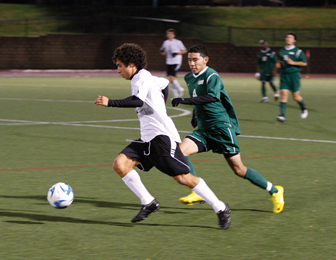 On Saturday, the Swarthmore mens’ soccer team soundly defeated McDaniel College 4-0. 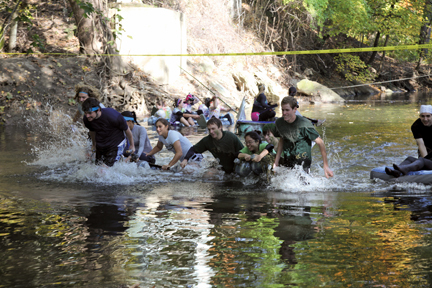 For participants in the Crum Regatta, winning was considerably less important than getting really wet. 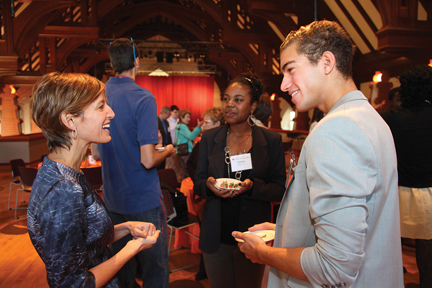 Glamour magazine editor Cindi Leive ’88 chats with students at lunch before delivering the annual McCabe Lecture to an enthusiastic crowd that packed the Pearson-Hall theater. 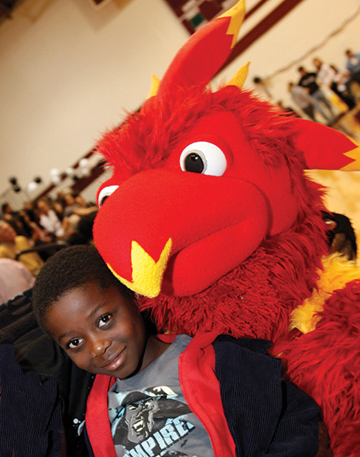 Tarble Pavilion resounds with laughter and pounding feet, as a game of “kick the balloons” involving a large red bird gets under way at the pep rally. 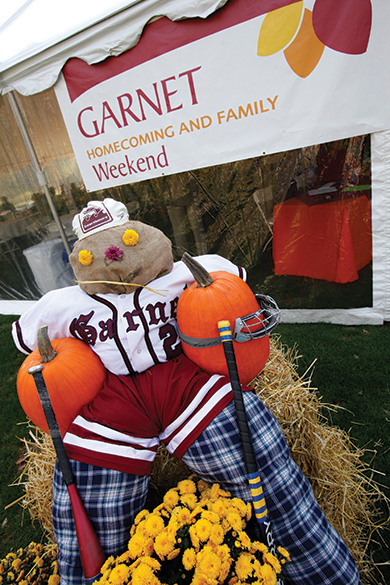 By Saturday evening, everyone is ready for a picnic in a tent on Parrish Beach, where diners are greeted by a scarecrow whose athletic torso and Swarthmore garb are impressive. 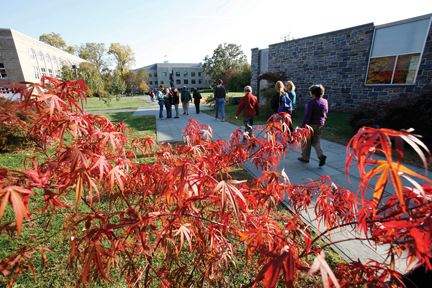 Framed by the autumn splendor of a Japanese red maple, members of the Swarthmore family revel in being home.